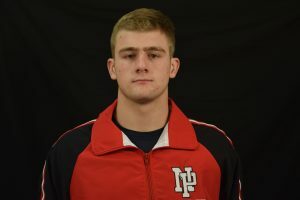 The New Palestine wrestling team had two victories by fall in a dual meet Wednesday against the state’s top-ranked team. NP fell 64-12 to No. 1 Cathedral, moving the Dragons’ record to 8-4 on the season. NP had two wins – both by fall. 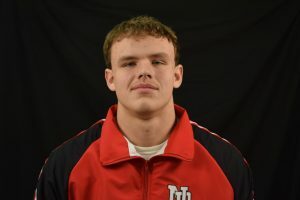 Landan Burton, ranked 13th in the state at 220, remained perfect on the year with a 20-second pin of Cathedral’s David Guhl. The Dragons’ other win came from Logan Robinson at 170, as he had a pin in 3:11. In the day’s closest match, Chris Hafley took his match at 152 to OT before falling 9-7. The Dragons next compete Saturday at the Northview Invitational. Senior Landan Burton had a 20-second pin and is now 12-0 on the season. Logan Robinson won by fall in the match against Cathedral.